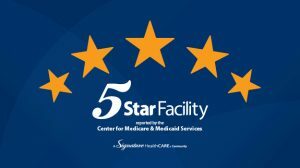 Two more facilities have joined the ranks of Signature centers with five-star ratings from the Centers for Medicare and Medicaid Services (CMS). CMS is the federal agency tasked with nursing home oversight. A five-star rating is the highest rating a center can receive. The newly named five-star buildings are Prestonsburg Health Care Center and Signature HealthCARE of Cherokee Park. Signature has continually worked to improve the quality of care provided in its buildings, which has translated to better CMS ratings. In late February, a total of 21 SHC facilities were named to this year’s U.S. News & World Report ‘Best Nursing Homes’ list based on CMS star ratings. This entry was posted in Uncategorized on November 25, 2015 by Signature HealthCARE. The Signature HealthCARE (SHC) Florida Panhandle Senior Olympics were recently featured on WJHG News Channel 7 in Panama City Beach, Fla. SHC facilities participating in the event were: Chautauqua Rehab & Nursing Center, in DeFuniak Springs, Fla.; Washington Rehab & Nursing Center, in Chipley, Fla.; SHC of North Florida, in Graceville, Fla.; SHC at The Courtyard, in Marianna, Fla.; The Bridge at Bay St. Joe, in Port St. Joe, Fla; and Surrey Place Care Center, in Live Oak, Fla.
Be sure to check out the story below! This entry was posted in Uncategorized on November 11, 2015 by Signature HealthCARE. This week is Pastoral Care Week, and what better opportunity for Signature to honor its facility chaplains who do so much for our residents, families and staff members, sometimes unnoticed? 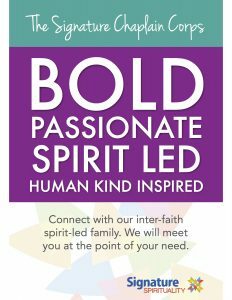 Signature’s Department of Spirituality was formed in 2005 by Dianne Timmering, Vice President of Spirituality and Legislative Affairs, and Signature President and CEO Joe Steier, with the intent of meeting people at the point of their spiritual need. 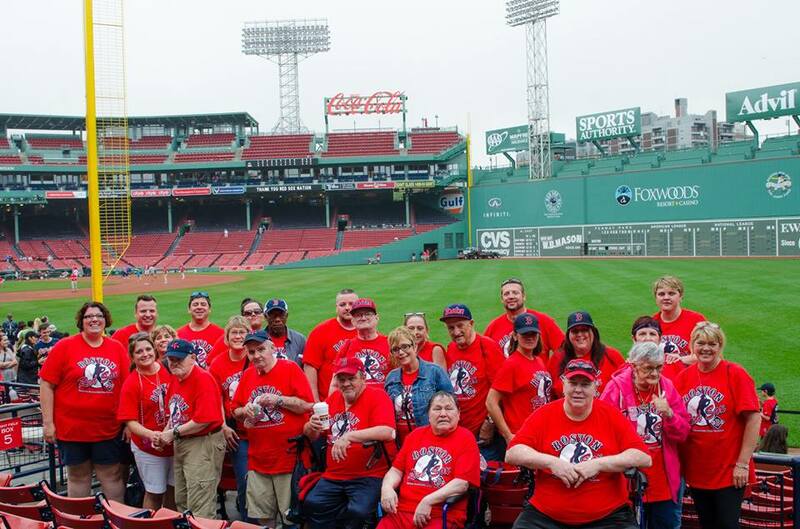 Signature has continued to expand the role of the facility chaplain, along with educational and other programming. Slated for 2016 is the spiritual design, by facility, to further build and integrate the spiritual deeper into the realm of overall care. Harrison said chaplains play an instrumental role in many functions, including marketing and business, employee morale and conflict resolution, partnering with Quality of Life and social services, and even as an adjunct to rehab and clinical processes. Timmering praised SHC’s chaplain corps for their unwavering commitment to assist in the healing process. For more about Pastoral Care Week, click HERE. This entry was posted in Uncategorized on October 30, 2015 by Signature HealthCARE. This entry was posted in Uncategorized on October 22, 2015 by Signature HealthCARE. Not only was Signature Spirituality recognized for its use of the STracker technology to track chaplain interactions with nursing home residents, Signature HealthCARE of Fentress County, in Jamestown, Tenn., received the Silver Award in the High Tech/High Touch category for its work with Signature affiliate ReadyMD utilizing telehealth technology. 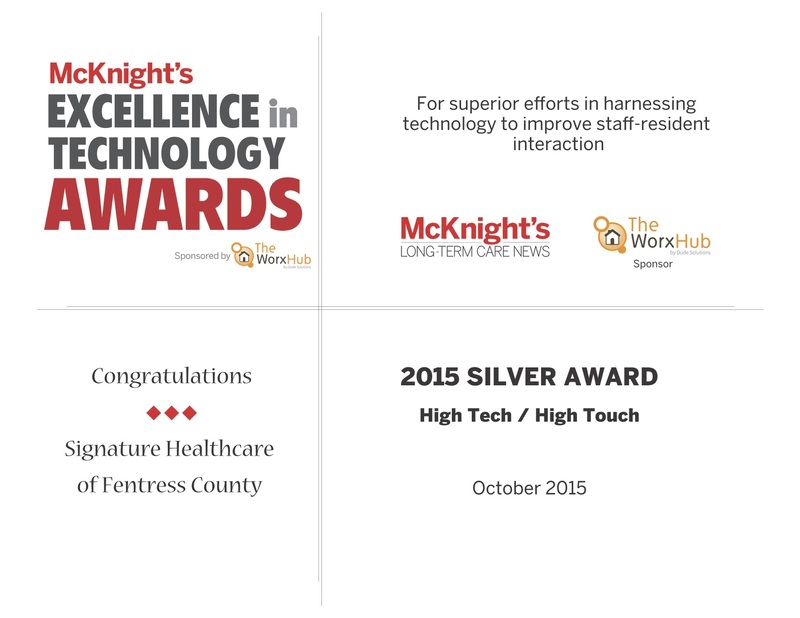 SHC of Fentress County was one of two sites – Erin, Tenn. was the other – where ReadyMD piloted its program, which gives nursing home residents access to psychiatric specialists and experts located at a remote site, a few miles or even hundreds of miles away. A psychiatrist or psychiatric nurse practitioner provides medication management services, and a psychologist or Licensed Clinical Social Worker will provide ‘talk’ therapy. The goal, according to ReadyMD CEO Dave Duggins is to improve overall quality of care for nursing home residents, including reducing return trips to the hospital for those residents. 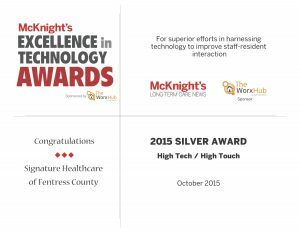 To date, about 300 residents have been treated at SHC of Fentress via the telehealth platform since the program launched in May. He added that, as the elderly population grows and an increasing number of baby boomers head toward retirement, the demand for physicians will only increase. As a result, telehealth technology will only be further integrated into the health care delivery process going forward, particularly in remote areas where fewer medical services are available. Telehealth services and technology is being implemented at three more Signature HealthCARE facilities this month, with 18 additional facilities soon to follow. This entry was posted in Uncategorized on October 9, 2015 by Signature HealthCARE. 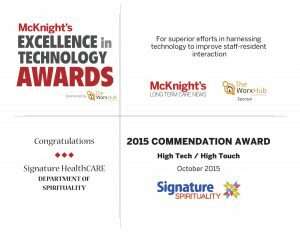 Signature’s Department of Spirituality was proud to be notified this week that the department has been named a winner in McKnight’s Excellence in Technology Awards for 2015. 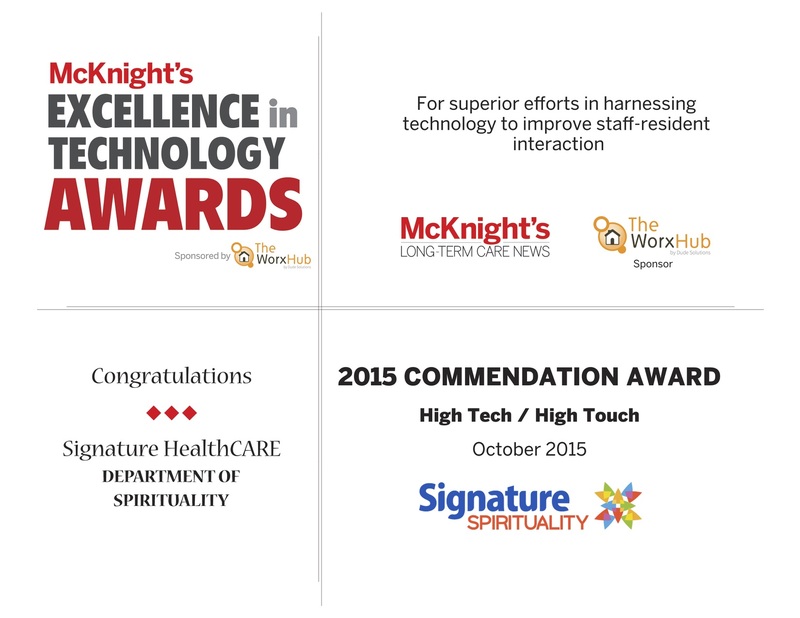 The awards program honors organizations utilizing technology to improve elder care. The Department of Spirituality was recognized for its use of a SharePoint-based tracking system known as ‘STracker’ (Spirituality Tracker), which represents the point of interface between Signature’s Spirituality and Clinical departments. 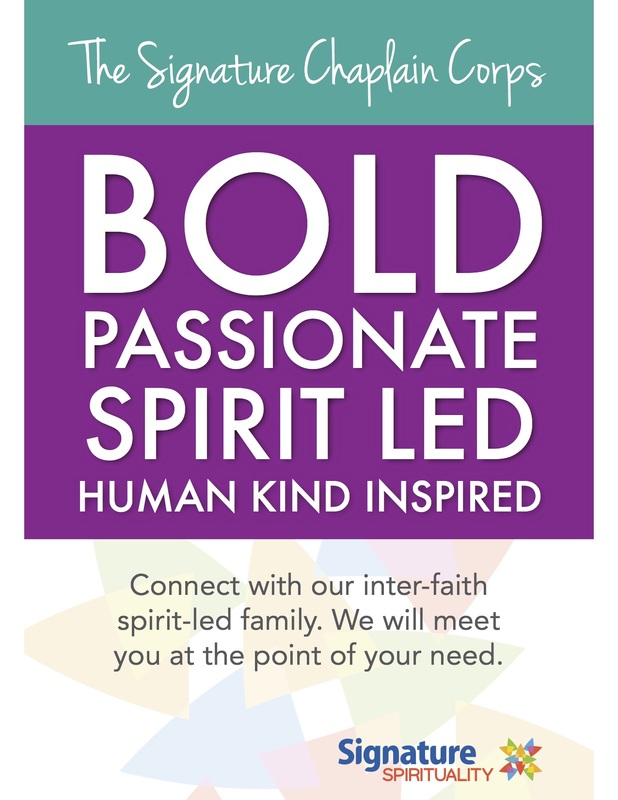 As one of the organizational pillars upon which the company was founded, Signature believes Spirituality and its free expression is an integral part of life for most people – something that can provide enormous benefits in health, well-being and happiness, particularly in cases where health and life status are altered, as in a long-term care environment. The system is designed to provide a universally-accessible system of online reporting for the numerous personal encounters that Signature’s facility chaplains share with residents, stakeholders, family members and others each week. STracker was developed with the intent of tracking the multiple inputs of chaplain care given for all manner of clinical (anxiety, depression, wound care, falls, psychotropic medications and others), operational or pastoral-related issues, as well as directing chaplain services toward vital areas of need within a facility. The system generates reports that are then sent to key personnel at facility, regional and home office levels, soliciting feedback and suggestions. 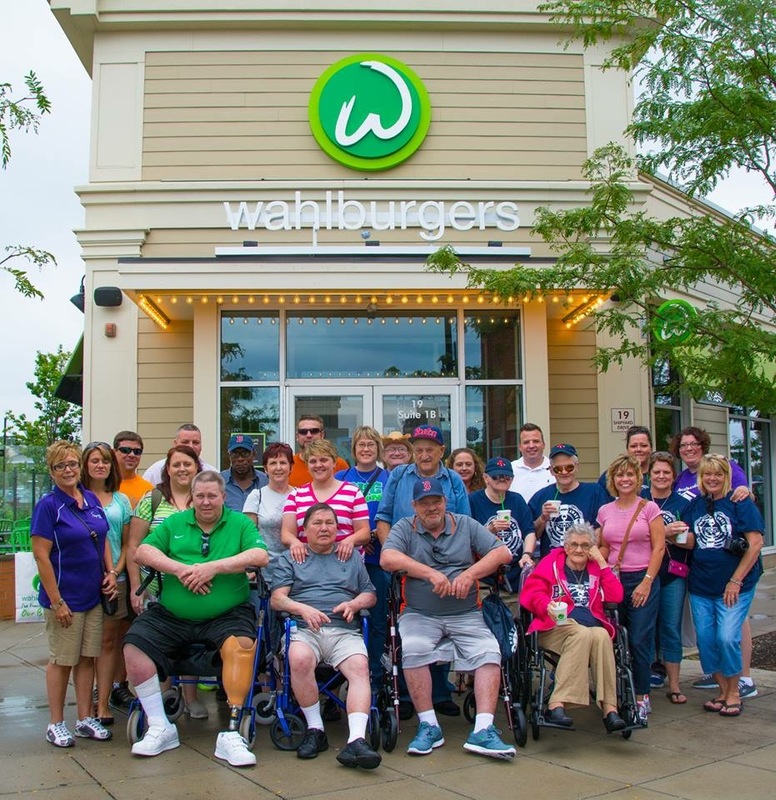 The goal, as always, is to empower team members and continually enhance overall care and quality of life for all the families and communities Signature serves. For more about the STracker system, visit the SHC Department of Spirituality online HERE. This entry was posted in Uncategorized on October 2, 2015 by Signature HealthCARE. Two top Signature leaders shared the stage this week with other national female healthcare leaders to address a variety of industry-related issues during the American Conference Institute’s ‘Women Leaders in Healthcare Law’ conference. Lynn Fieldhouse, Signature’s Vice President and General Counsel of Litigation Services, and Cheri Glass, Vice President – Talent Acquisition and Human Resources, traveled to Washington, D.C. to participate in the conference, which was several months in the planning. Fieldhouse also served as co-chair of the event. The conference’s gender bias was fitting for an industry dominated by women professionals. Women make up nearly 79 percent of the nation’s overall healthcare workforce, according to 2014 data from the U.S. Bureau of Labor Statistics, and account for more than 85 percent of the workers in skilled-nursing facilities. Meanwhile, women make up about 86 percent of Signature HealthCARE’s overall employee base. “Signature has a strong team of women leaders, at our Home Office and in the field, so involving our company was truly a great fit,” Fieldhouse said. Both Signature representatives called the event inspirational and said they were honored to participate. Nearly a fourth of Signature’s skilled-nursing and rehabilitation centers are now on the registry for The Eden Alternative, with Standing Stone Care & Rehabilitation Center, Pine Ridge Care & Rehabilitation Center and The Bridge at South Pittsburg becoming the latest to join the list this week. The Eden movement within Signature began in the rural segment, Signature Hometown, in 2012. Since then, a total of 32 Signature facilities have joined the registry. This entry was posted in Uncategorized on September 29, 2015 by Signature HealthCARE. 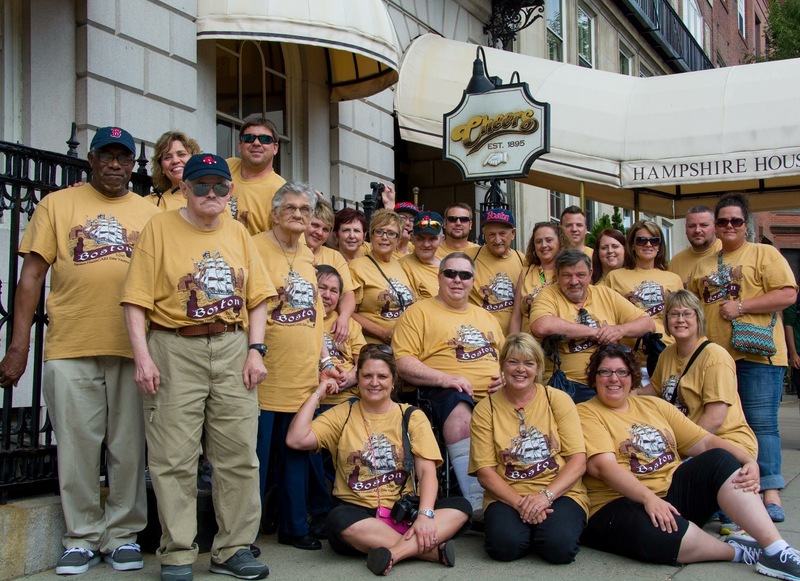 Signature made a return trip to Boston this week, this time with even more residents and staff members than last year’s maiden voyage. 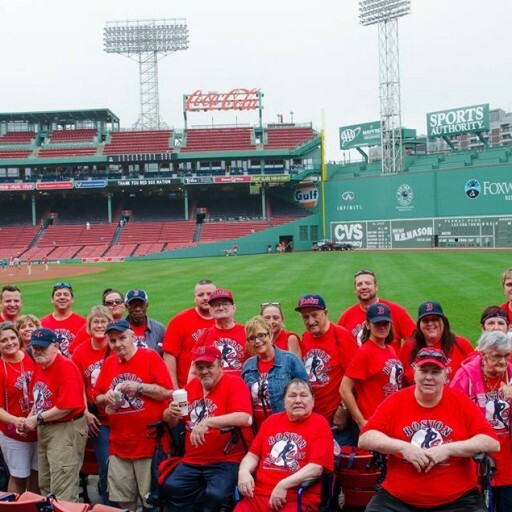 A total of 26 residents and staff from five Signature facilities in three states made the journey this year. Earlier this year, a separate group traveled to Panama City Beach, Fla. (for highlights, check out Signature’s YouTube channel.) 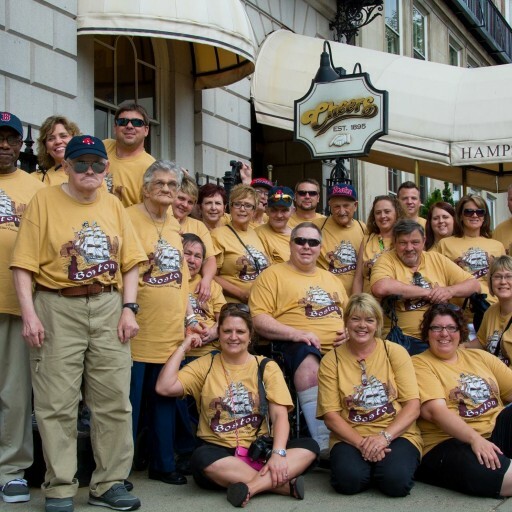 Signature has taken groups of residents on vacation each of the past four years. Visit the SHC Quality of Life blog for details from Angie McAllister, Director of Cultural Transformation for Signature’s Hometown segment. This entry was posted in Uncategorized on August 27, 2015 by Signature HealthCARE.